Challenges to tackle are many to ensure the growth of our cities are sustainable and inclusive. So, how are we tracking? How are we designing and delivering new and renewal precincts that meet our environmental and social targets? This half day seminar will provide a timely platform to discuss best practices, successes and challenges in this exciting and evolving sector. Join us to hear from leaders, experts and practitioners as they will share their visions, strategies and experiences. The importance of biodiversity: how do we bring nature back in our cities? How do we deliver against local and international sustainability frameworks? This event has a few different booking options. If you would like to register for the full day (recommended! ), your ticket will include both the morning seminar and afternoon session. If you think you'd prefer to attend just one, you can register for either the morning seminar or afternoon session separately. This course has already occurred. 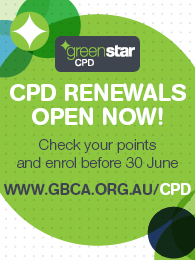 4 Green Star CPD point(s).